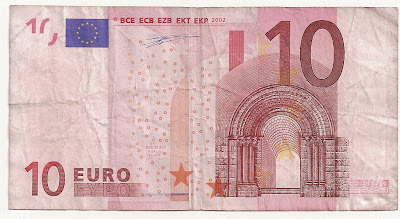 "Holograms: the €5, €10 and €20 notes carry a holographic band to the right of the front side. This band is imprinted with the note's denomination; e.g., "€5 €5 €5...." in the case of the five-euro note." That was kind embarrassing but when the seller passed the note on one machine he had there was no fake alarm. I gave him another banknote anyway. After that, when looking careful to it, I started thinking it is a defective banknote. I don't know what the odds of finding a banknote like this are. Maybe one day I'll sell it on eBay. This happens more than you might think, certainly on the £5 note in the UK. These have a holographic area and it is not uncommon for those who often deal with money to see them missing. We just send them to the bank, who send them to the Bank of England to be destroyed.